Looking for a quick and easy salad that requires minimal prep? 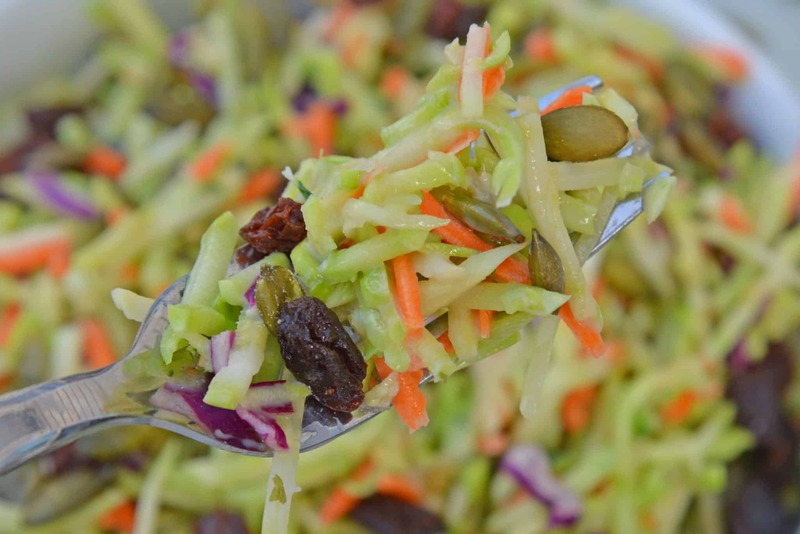 You’ll love this Crunchy Broccoli Slaw Salad! 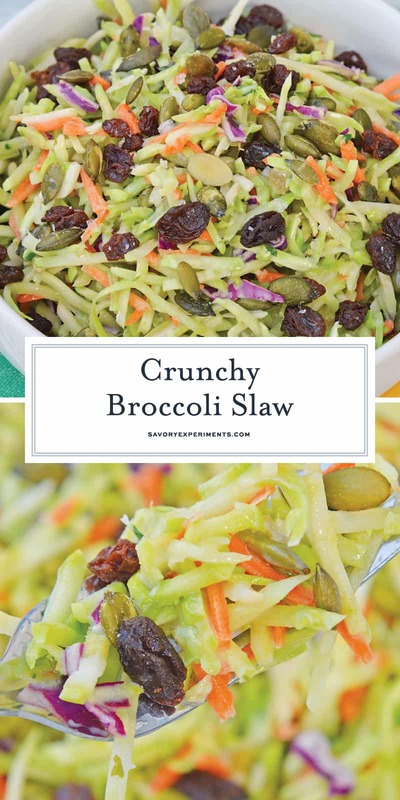 This Crunchy Broccoli Slaw is made with a bagged broccoli slaw mix and a few added ingredients for a broccoli salad that’s quick, tasty and easy to make! What’s just as delicious as broccoli salad but easier and lighter to make? This homemade Crunchy Broccoli Slaw salad! It literally takes less than 5 minutes to make, with my super easy short cut…. Instead of chopping my own, I usually just buy a bagged broccoli slaw mix. It is made up of raw broccoli, red cabbage and carrots. Sometimes it even incorporates brussel sprouts too. But, you know what, you can use whatever slaw mix you want! One of the biggest issues with bagged slaw mix is that they look sad and dried out. But no worries, it is actually pretty easy to revive them! Place your slaw mix into a large mixing bowl filled with ice water. Allow it to sit for 10-15 minutes and then drain. 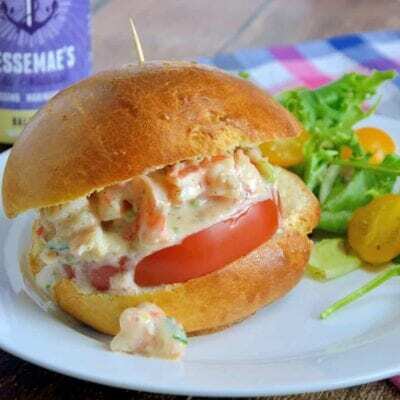 You want to pat it dry with a paper towel the best you can before adding creamy honey mustard dressing. 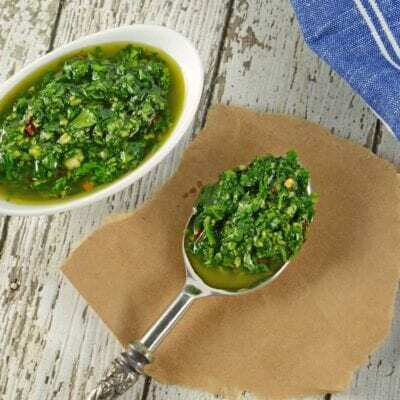 Wet slaw won’t allow dressing to stick well. 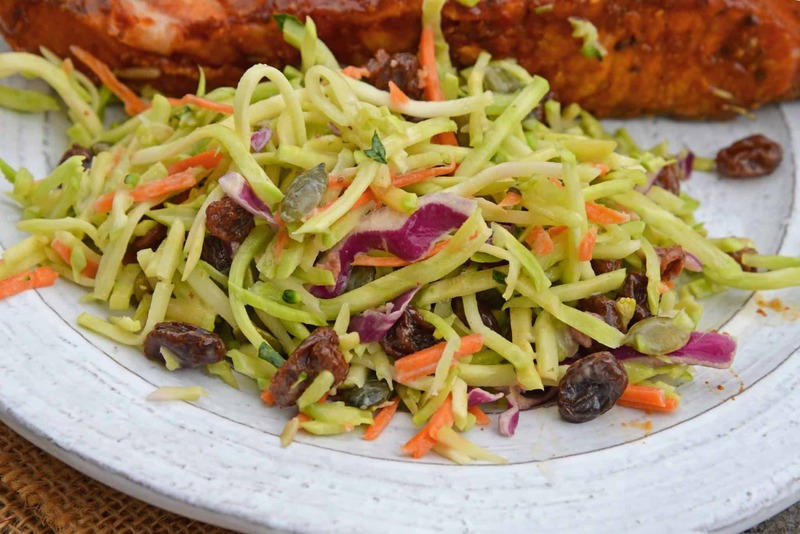 In fact, this slaw needed a little pick-me-up and it looks great! Then, to take this broccoli slaw to the next level, I throw in a fix extras, like pepitas and raisins. Pepitas are one of my favorite seeds to use in salads. They are a vibrant green and usually salted. 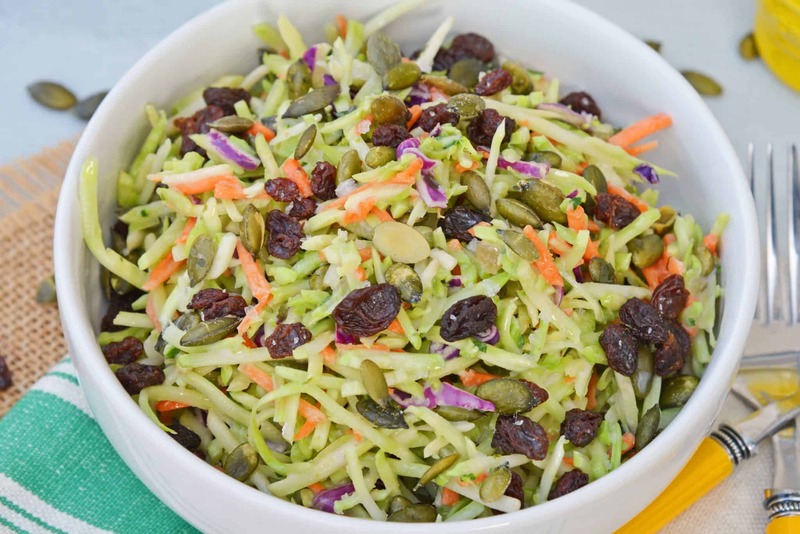 You can use any other type of nut too, this slaw also does well with slivered almonds. 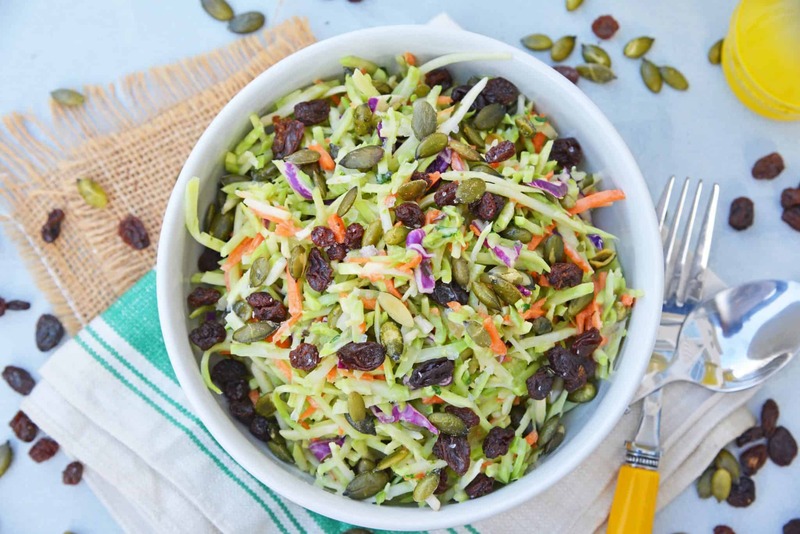 The raisins provide a sweet and soft contrast to the rest of the ingredients in this crunchy broccoli slaw. Instead of a mayo-based dressing like traditional broccoli salad, I top this with a creamy honey mustard. It tastes so yummy with the broccoli mix! 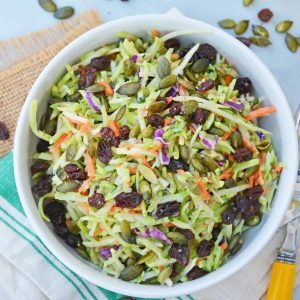 This Broccoli Slaw Salad makes a great dish for summer cookouts and is so much easier to make than broccoli salad. Everyone devours it just as quickly too! I also like to serve it at home when I need a quick veggie or side dish and don’t feel like cooking. 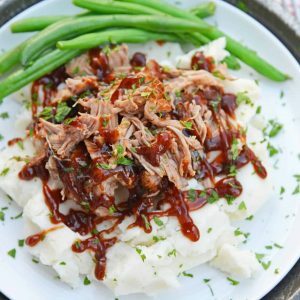 It’s a great side for any type of meat. This Crunchy Broccoli Slaw Salad is made with a bagged broccoli slaw and a few extra ingredients for a quick, easy and tasty side salad! 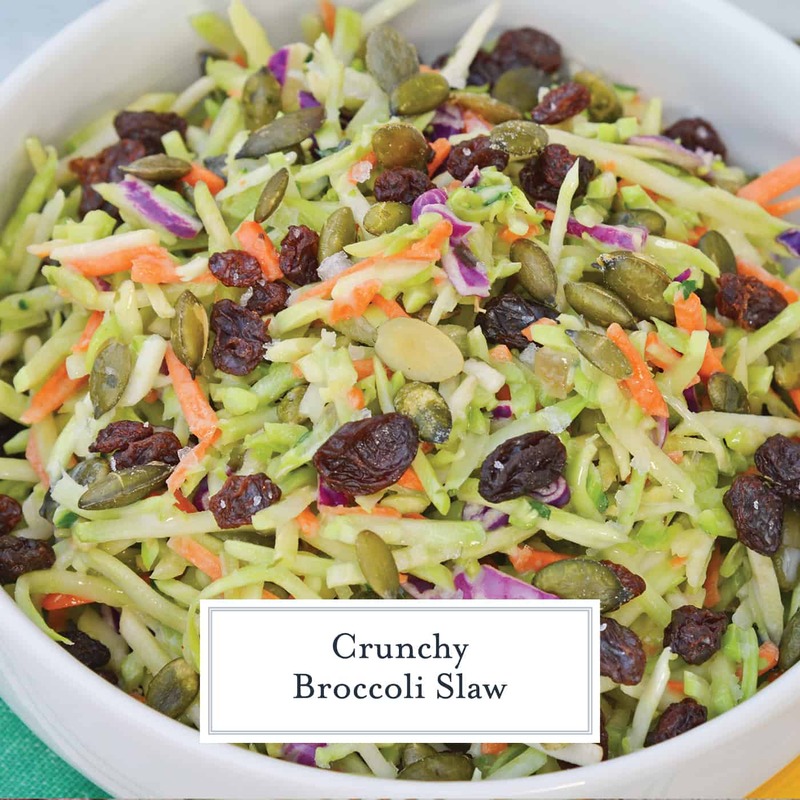 Combine broccoli slaw mix, creamy honey mustard raisins, pepitas and Kosher salt in a medium mixing bowl. 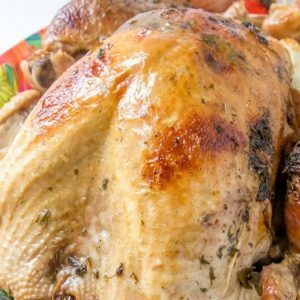 Toss well, cover and allow to sit for 10-15 minutes before serving. THIS IS SUCH A WONDERFUL, FIBER RICH and CLEAN SALAD IDEA. As a huge ColeSlaw faN, I can’t wait to try your twist with broccoli. I Also love your lighter honey mustard dressinG. I love how simple this is and definitely prefer the idea of a honey mustard dressing to mayo. Yum! This sounds delicious! Printing it out and adding to to the menu plan! Yes I’m always looking for quick easy salads i can meal prep for the week. This looks delicious and I’ll bet it would hold up well in the fridge. This is just the kind of side dish that goes so well at any potluck. 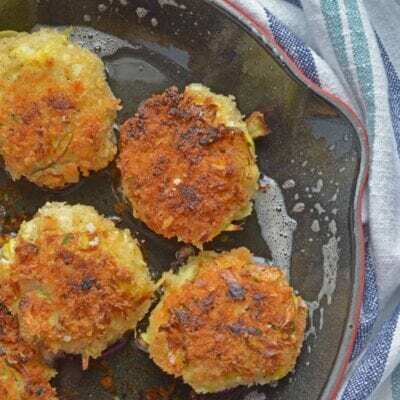 Crunchy and savory with a hint of sweet — so good!